Cast porcelain plate, circular with wide moulded rim, which has linear patterning delineated and with chequered in-fill in underglaze blue. (Note in Register) It seems possible that van de Velde designed the linear pattern only and that the chequered in-fill was a slightly later addition by the factory. See also C.37A&B-1990. Henry van de Velde was invited to produce designs for Meissen in 1902, two years after they had been severely criticised at the international exhibition, Paris 1900, for their over-reliance of traditional forms and their unadventerous production policy. He produced some highly stylish patterns, using the traditional Meissen underglaze-blue painting technique. 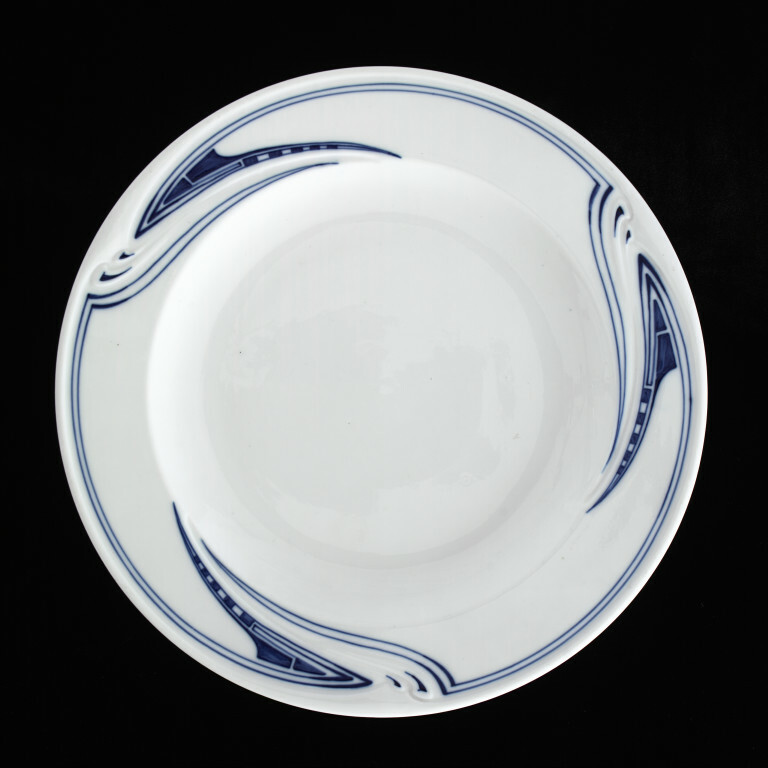 This pattern is one of the best known of "Art Nouveau" designs for table ware. Van de Velde was invited to design for Meissen a year earlier than Riemerschmid and produced a service which took no account of Meissen tradition except in the use of underglaze blue. Plate, cast porcelain with hand-painted underglaze decoration, designed by Henry van de Velde, manufactured by Meissen, Germany, ca. 1904. Hiesinger, Kathryn Bloom, ed. Art Nouveau in Munich, Munich, 1988, 19 p.